We would love everyone to come on down for a morning of fun and show your support for Ocean Shores Tennis Club and our community. Your support will help us to improve our facilities and Water Lily Park for our families and our friends. If you can help out on the day with cake stall, bbq and kids activities it would be greatly appreciated. Please pass on to everyone you know and get people involved. 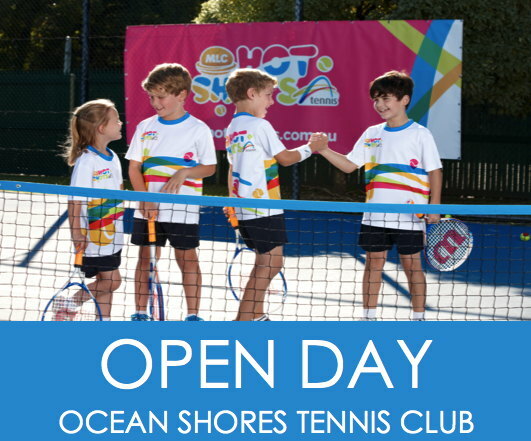 Come and try Tennis! Join us for a day of fun and games. There will be games, challenges and prizes to be won! A free gift for every child that participates! Bring a racquet or borrow one of ours. BBQ, drinks, tennis equipment & jumping castle will be available.